No doubt...we all love to have mushroom especially veggies. 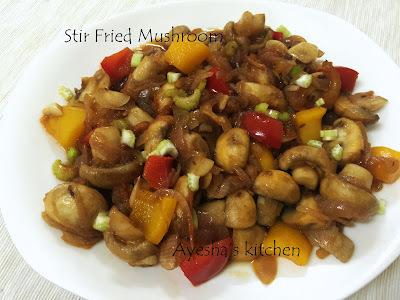 Butter fried mushrooms with our favorite flavors are always a lip-smacking stir fry which is used as a finger food in most of the places. Me too..often made it for my kids and they loved to have it without adding peppercorns. A sweet, hot, tangy, peppery flavor with a soft plump texture of mushrooms and the crunchy bite-sized bell peppers made this buttery stir fried dish tastes heavenly. Sure, you will try this lip-smacking finger food. Here is the recipe for buttery stir-fried mushrooms. Do try and enjoy your weekends. Heat a wok with 1 p of melted butter. When hot add the sliced tomato and saute until done. Transfer to a plate. Now add 1 tsp of butter again and saute the sliced mushrooms for few minutes or until 90% done. Transfer to a plate. Now to the same heated butter, add chopped garlic and saute until the raw smell disappears. Then add the sliced onion and saute for few minutes. Check for salt and add bell peppers. Toss well. Now add the sauteed tomato and mushroom to this along with crushed peppercorns. Let it cook with the lid open for few minutes. This dish is prepared for my breakfast side dish and so I just don't dry the entire gravy. But if it is used as a finger food, just toss well in a high flame until dry which tastes awesome.